Strangely my Punchestown adventure began on a train to Yarmouth on the opening day of the Festival. I was visiting a customer and spent some of the journey looking at the betting prospects for my visit to Ireland later in the week. What caught my eye in the Racing Post was an article on the top jockey and top trainer at the Festival. Victor Chandler was sponsoring both competitions and promoting prices. This could be an ideal way to get involved in the action particularly as their prices looked wrong! 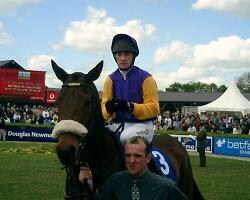 In the jockeys’ event, VC had Paul Carberry as a 6/1 shot. This was value as he had some very good mounts on the first day and Harchibald, the odds-on favourite for the Punchestown Champion Hurdle, to look forward to on Friday. Ladbrokes were offering 7/2 which looked nearer the mark. In the trainers’ event, Willie Mullins, the top trainer at Punchestown over the last five years with a near 20% strike rate, was priced at a stand out 8/1. Ladbrokes made him favourite. Two strong ante-post bets were placed, to set me up (hopefully) for my visit on Friday, the last day of the four-day Festival. 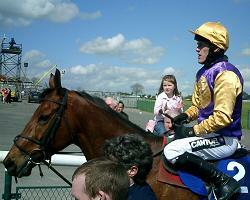 To my delight I discovered later that Paul Carberry had won the first two races on Davids Lad and Wild Passion. Willie Mullins was successful too with a winner, second and third. A good start. With Noel Meade, the obvious danger, training only one winner and no places, I felt I had to go in again on Mullins, as he was available on Wednesday morning at a still generous 11/2. Friday was a very early start from London and following some business attended to in Dublin, I just made it in time for the first race at Punchestown. Adrian, my racing friend had made the journey independently and despite having a broken ankle and walking on crutches made it to Punchestown too. The jockey and trainer bets were looking quite promising going into the final day. Carberry was 3,1,0 (wins, seconds, thirds) with his closest rival Barry Geraghty on 2,2,3. Although clearly if Geraghty was to draw level with Carberry on winners, I would almost certainly lose. The trainers’ situation was very tight as Meade had the day’s best prospects by far. The scores were Mullins 3,2,2 and Meade 2,2,1. 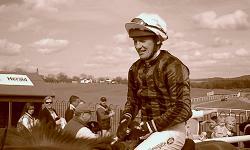 Of course Paul Carberry rides for Noel Meade so one winning selection rather than the two looked the best I could hope for. In fact Paul rode Carndale for Noel Meade in the first and I had a small tote bet on it even though I really didn’t want it to win. It finished third @ 16/1. The second race held little interest for me as none of the leading jockeys or trainers was involved. This brought us to the feature race - the Champion Hurdle. I’ve been watching horse races on and off for about forty years and I can safely say this was the most exciting five-runner race I’d ever seen. Barry Cash had been jocked-off Brave Inca in favour of McCoy and with no disrespect to Barry this made the difference at the line. McCoy set out to make the running, initially at a slow pace. The leader needed reminders four-out and was hard ridden with two to jump. Brave Inca, Macs Joy and Harchibald came to the last virtually in line and Paul Carberry appeared to be going very easily indeed on the latter. As Harchibald hit the front the roof nearly came off the stands. The punters’ euphoria was short lived however as Brave Inca rallied under pressure to regain the lead close home and win by a head. Apart from being a great race it was also a dream result for me as Meade trains the second and Geraghty was on Macs Joy who finished third. However, because of the second place, a winner from Meade would almost certainly mean he would be top trainer as Mullins had very little ammunition left. Meade had two runners left, Mullacash in the next which I backed to small stakes on the tote and again it was to finish third @ 16/1. The next race, the fifth, was the Champion Novice Hurdle and here was an opportunity for Carberry to wrap up the top jockey award by riding his fourth winner of the Festival. He was aboard the 6/4 favourite Asian Maze. The mare followed up her recent Aintree win with a devastating display of front running. She went clear at the second last and could have won by a lot further than the five lengths’ margin. Carberry spent the last couple of furlongs looking disdainfully through his legs at the opposition. With the Carberry bet landed, only one horse could now upset the Mullins bet. This was the Meade-trained Augherskea in the sixth, a twenty-five runner Novice Hurdle. Unfortunately it was 11/4 favourite which would necessitate an expensive hedge. A chunky bet on the tote – showing around 4/1 – was the answer. I also backed three outsiders to small stakes on the tote. A big race for me as my Mullins bets were potentially worth a good few quid. I could not believe my luck. The favourite was never there with a chance and one of my outsiders, Snoopy Loopy, collared the second favourite on the run in and paid a 31.20 dividend on the tote (16/1 SP)! All ante-post bets landed and a profit on the day’s bets too. We fiddled about on the tote in the two bumpers that closed the Festival with no returns, but this had been a remarkable day, the highlights of which were the Champion Hurdle finish and the stunning performance of Asian Maze. As soon as we got back to Dublin we went for a celebration dinner at La Mere Zou ( www.lamerezou.ie). I had not been here for nearly four years and it was good to go back, this time into the new no smoking environment. I had white asparagus salad with black truffle dressing and crab samosa to start followed by seared scallops with artichoke barigoule and plum tomato confit. Delicious and strongly recommended. Saturday it was back to Punchestown for a non-Festival meeting – a bit like an old Ascot Heath day I suppose. The place could not have looked more different. A very, very small crowd. Why not call it part of the Festival and quadruple the attendance? We had taken a table in the restaurant as Adrian was having trouble hobbling about the racecourse. We declined this option the previous day as a table was priced at 5,000 euro. Saturday was a better deal at 85 euro a head including admission and race card. The Panoramic Restaurant was very impressive with spectacular views. We had a couple of seats on a table shared with others, although there was plenty of room. For one moment we thought we might have to make conversation rather than concentrate on the task in hand (finding winners). A Suit and his Kronenburg* wife looked as though they were coming to sit next to us but thankfully changed their minds. As for the restaurant food, well it was OK but no more than that. Choices were sea trout or sirloin of beef or some vego dish. At least we had the seats for the duration of the eight-race card as well as a waitress tote facility. The punting was spectacularly poor in sharp contrast to Friday. I did not back a single winner. Shame about the conversation option. Saturday night it was time to visit another old haunt – the Porterhouse. Many pints of the delicious oyster stout were consumed, whilst listening to some excellent traditional live music. If you get peckish go for the Thai prawns in an explosive chilli sauce. Sunday and day three at the races, this time thirty miles north of Dublin to Navan. The feature race was the Vintage Crop Stakes, a Listed Race over 1m 5f. A bit of a problem with the catering here. We’d hoped to sit in the restaurant again but the menu was sea trout or sirloin of beef. Exactly the same as the Punchestown menu the previous day, even though it was a different catering company! A children’s party with disco music occupied the rest of the new stand (I kid you not and no I don’t mind children getting in free to racecourses). Sausage and chips was the only meal on offer. So it was chocolate bars and a couple of hard seats in the tote credit office. Not much luck here early on. We played the carry over jackpot, the carry over exacta and the carry over trio. No joy. In the Vintage Crop Stakes I backed John Oxx’s second string Mkuzi which was a big price on the tote. However his principal contender Icklingham won the race impressively. The little mare Solerina ran a great race to finish third having led until the two-furlong pole. We took a small interest in the next couple of races and then, at last, a decent betting opportunity arose in the closing heat. Ardenteggle Lad in the second division of the maiden. A tissue price of 6/1, it opened only 5/2 in the ring and eased to 4s. But it was showing at 10/1 on the tote near the off. Time to bet like men. We were not to be disappointed as the selection suddenly went clear three furlongs out and held on gamely to win by a couple at the line. A juicy 9.60 divi meant a good winning day and a chunk of Saturday’s losses eradicated too. Back in Dublin for our last evening meal - one of the best pizzas I’ve ever eaten - at a small restaurant called Millers Pizza Kitchen in Upper Baggot Street. Try one of their seafood specialities, washed down with a glass of house wine. Unbelievably good. After nearly four years of visiting the rural tracks to complete the portfolio, a triumphant return to Dublin and one of the most financially rewarding racing trips of all time. * 16 from behind, 64 from the front.